Of course being the last day of the month means it's time to reveal what I received from my Foodie Pen Pal. This month I sent a package to a non-blogger named Carma and received a lovely package from Lauren at From Every Day to Gourmet. 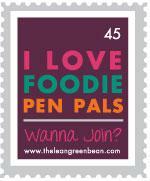 Every month I look forward to Foodie Pen Pals, a concept thought up by Lindsay over at the Lean Green Bean. 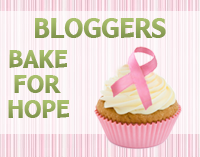 Go visit her blog to learn how to join--bloggers and non-bloggers are welcome! Each month you'll have a chance to send a box full of goodies to on foodie while receiving a box from another foodie. It's a great way to try new things and meet new people. This recipe comes from Jamie at A Southern Fairytale, and was originally a full size loaf of bread. I used frozen blueberries in lieu of fresh, and adjusted the bake time for the mini muffin size. A simple recipe just two bowls, a whisk and a spatula, so minimal time and clean up investment. Another perfect brunch buffet treat or just a little something extra to add to breakfast or as a little midday snack. Simple and delicious--make these and share with someone you like soon. In a large bowl, whisk together eggs, oil, vanilla and sugars. Add flours, salt, baking powder, baking soda and cinnamon, and stir to combine. Using a medium cookie scoop, distribute batter into a greased mini muffin tin. Bake at 350 degrees for 12-15 minutes or until set and a tester inserted in center comes out clean. Cool in pan for a few minutes then remove and transfer to wire rack to cool completely. Makes 2 1/2 dozen mini muffins.